Story: Are you a junk foodie? My whole family is.. as a kid I would go out with my Mom to explore street food - Bhel, Panipuri, Vada Pav, Pav Bhaji.. the list is endless. When my family gets together we often talk about what junk food to eat where.. which vendor sells the best pani puri etc etc. Mumbai Frankie is one of many popular dishes you get on the streets of India (at least around Mumbai). Frankie is basically like a toasted burrito. Also similar to Kati roll.. that reminds me - if you are in NYC you must taste the best Kati Rolls from The Kati Roll Company. Their Paneer Kati Roll and Chicken Unda Roll is to die for..
anyways.. back to Frankie.. usually it is filled with spicy roasted veggies, cheese and is eaten hot with ketchup. To create the fiesta effect I used Gua-lsa (Guacamole and Salsa) with cheese on Indian roti (a thin whole wheat tortilla). If you have rotis ready... this is the perfect quick fix on a weekday evening..
Heat 1 tbsp oil in a pan. Saute peppers till they become a bit tender, then add onions and increase the heat. Saute on high heat till you get a bit of char on the veggies. Add the kernels of roasted corn and mix well. Get all the other raw material - rotis, gualsa and cheese. 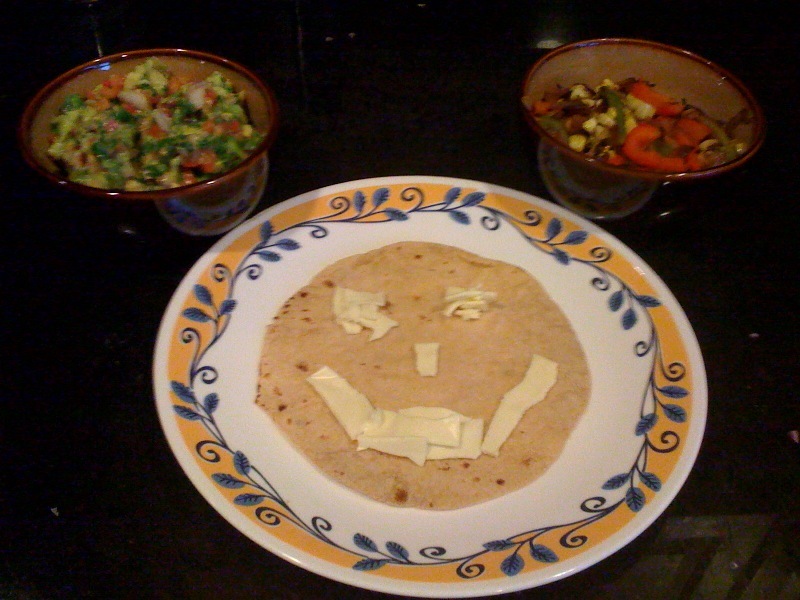 Place a roti in a plate, Add little over 1 tbsp of roasted veggies, 1 tbsp of gualsa and 1/2 tbsp shredded cheese. 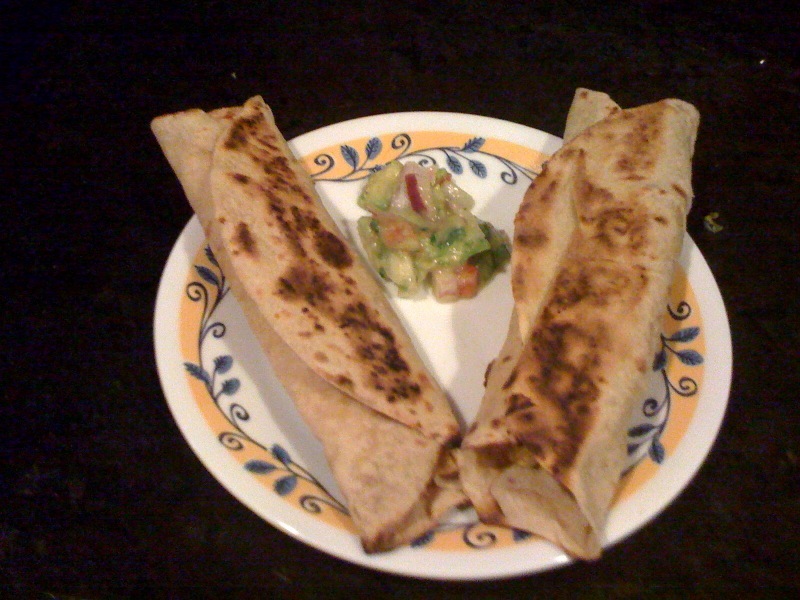 Roll the roti like a burrito. If you cannot close it from the sides - that's ok. Just be careful when roasting the roll on a pan. Roast on both sides.. Serve hot with a soup or a drink depending on the weather. :) Shanu, I am curious.. what is in the FrigTemp Frankie..